Starbucks accounted for more than 90% of all mobile transactions in the US last year, the coffee chain’s CEO Howard Schultz has revealed during a fourth quarter earnings call in which he also set out plans to continue to dominate the mobile payments space. “In 2013, payment for purchases by use of all mobile devices in the US totalled $1.3 billion, that was the entire market,” Schultz explained during the call. “Now listen to this. With over 90% of those purchases taking place in a Starbucks store, that means we had 90% share of mobile payments in 2013 while brick-and-mortar commerce in 2013 totalled more than $4.2 trillion. “Now what you’re going to see in the years ahead will be a rapid acceleration in mobile device purchases and a continued significant migration away from bricks-and-mortar commerce. There is obviously a huge prize there and that’s why we’re seeing so much activity around the payment space from all kinds of companies. “We’ve accomplished this by integrating the convenience of mobile payment to a compelling and enjoyable program that gives our customers rewards,” Schultz continued. “No company and no retail store domestically or internationally even comes close. And, while that figure has been growing by almost 50% per year, the real growth is yet to come. Starbucks Coffee Company has cracked the code at tying mobile payments to loyalty and we are now receiving great interest in partnerships from mobile payment companies who see the value of our rewards program and the mobile payment behaviour we established. “While Starbucks is today an uncontested leader in mobile, we will continue to innovate and lead around all things mobile in order to attract additional users of our app and provide an enhanced and simplified experience for our customers,” he added. “Perhaps the single most important technology innovation we will introduce this year is Mobile Order and Pay which debuts in Portland in December and will be rolled out nationwide in 2015. And, while many people are talking about mobile and pay, what Starbucks is going to do and execute is quite different than anyone else in the marketplace. “Our research confirms that we can drive even more traffic and incrementality and offer even more customers more convenience in more locations by allowing them to place orders ahead of time via their mobile devices and pick their orders up without waiting in line. Starbuck’s Mobile Order and Pay is a totally unique technology. “It seamlessly integrates mobile ordering and our proprietary loyalty program with point-of-sale store operations, enabling us to enhance our customer experience, exceed our customer’s expectations of convenience and extend customer loyalty. 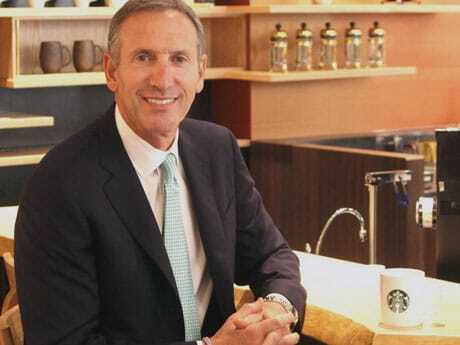 “Imagine the ability to create a standing order that Starbucks delivered hot or iced to your desk daily, that’s our version of ecommerce on steroids,” Schultz added. “All this will grow Starbucks Rewards, our loyalty program that now has eight million active members, up 23% over quarter four last year and has been launched in 26 countries.